Dried green onions (a.k.a. scallions) have a mild onion flavor and include both the white and green sections of the onion. Sliced into 1/4" pieces. We like to mix them into mashed potatoes, soups, salsa, and dips. Net Weight: 16 oz. / 1 pound / 454 grams. Ingredients: green onions. Packaged in a facility that also packages wheat, milk, soy, egg, peanuts, and tree nuts. 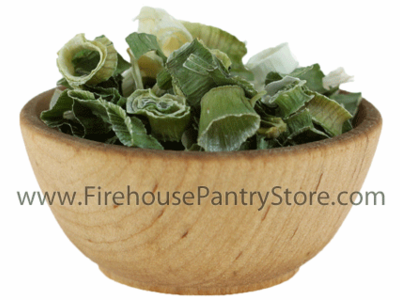 We use these in our Groovin' Green Onion Dip Mix and Irish Pub Spread Mix.